Hello! We’re finally back from our fabulous trip to England and Wales and slowly recovering from jet lag. We’ve been going to bed at 9:00PM and up by 7:00AM the past few days since we got back. I’m never up that early by choice! *hah* Maybe I’ll be a morning-person yet? *hah* Not likely. Today is the first time we’ve seen the sun in 14 days! It was very rainy and chilly in London. And we came home to similar weather. Alas, today, on my first day back to work…the sun came out! :) Hmmmm…. So, in celebration of a nice sunny, spring day, I’d like to share a recipe perfect for spring picnics and BBQs – Tzatziki Potato Salad! This salad is loaded with wonderful spring flavours such as fresh dill and lemon. And it’s lightened up by using fat-free greek yogurt with only a touch of mayonnaise. Add some garlic, cucumber and a bit of feta cheese and you’ve got one flavourful salad. Feel free to add some freshly chopped mint to this salad. Mint and dill pair up nicely with fresh lemon in this tzatziki. Bring large pot of water with potato cubes to a boil. Allow potatoes to cook until fork-tender. Drain and rinse potatoes under cold water. Set aside. Place shredded cucumber in a bowl lined with paper towels. Allow cucumber to sit for about 10 minutes while the potatoes cook, so that some of the cucumber juice is absorbed. In a small bowl, whisk together the fat-free greek yogurt, low-fat mayonnaise, garlic, and lemon juice. Add drained, shredded cucumber . Season with fresh chopped dill, salt and pepper. Note: if you are using feta, don't use too much salt when seasoning the tzatziki. In a nice serving bowl, combine the cooled potatoes and the tzatziki sauce. Add 1/4 cup of crumbled feta cheese and mix. Allow potato salad to sit in the fridge or at room temperature for at least 30 minutes before serving to allow flavours to meld. I love this! I’m posting a recipe that involves tzatziki next week and it was the first time I’ve ever had it and now I’m a little bit obsessed. Using it in a potato salad is an awesome idea! Good luck with jet lag, I hope it will pass soon. I can imagine all the beautifull memories you have :) I like tzatziki a lot and I like the idea of mixing it with potatos. Thank you! xo Jet lag is slowly going away and I’m going to bed at a more normal time. The first few days home, I was going to bed right after dinner! Hah! My mom just sent me an email with the subject line “sounds good,” and the link she provided sent me to this recipe! The potato salad does sound pretty amazing! Glad you had a great time in England. Welcome back! I remember when I went to Europe I was waking up around 7am too (not natural for me) and I thought it would last and I would start being so productive in the mornings, but I adjusted back pretty quickly! This potato salad looks awesome, love the idea of tzatziki! Hahaha! So true! I was getting up at 7 over the weekend, but now I need to get up for 7 for work….and I so want to stay in bed and sleep! So much for being productive! what a beautiful potato salad! i love potato salad and eat way too much of it. the yogurt sounds like a great way to keep it a bit lighter. and welcome home and YAY for sun! Genius! How do you come up with all of these inventive ideas for food? Potato salad and tzatziki together seems like it should have been around forever, a natural fit! Hope you had a really good vacation! 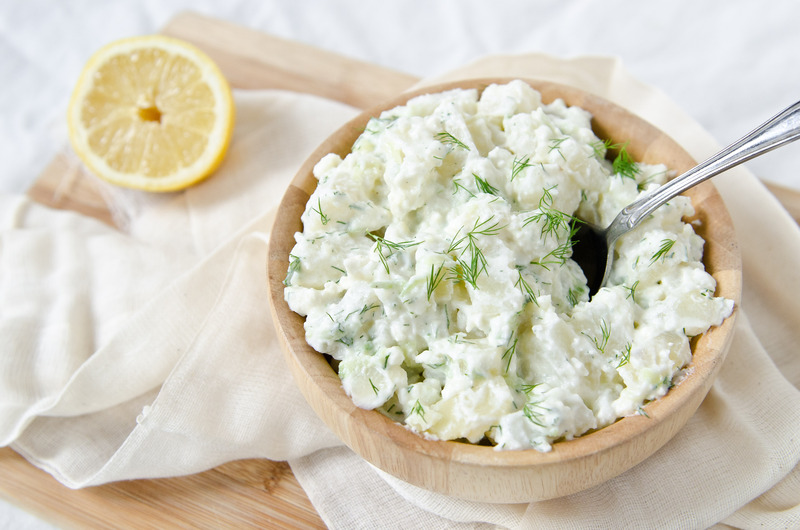 Yum, I love tzatziki so this is such a good idea for a potato salad! Too bad it was rainy for your whole trip – I think that’s the main reason why I could never live in the UK! Glad you’re back safe and sound and enjoying the sunshine! This sounds fantastic! I love Vegenaise, and I am ALL about all things that involve dill right now. Yum :). Me too! I love dill. I’ve been sprinkling it on salads lately. So yummy!